For the past several years I have been working with BC Biermann on Augmented Reality projects under the title Re+Public. 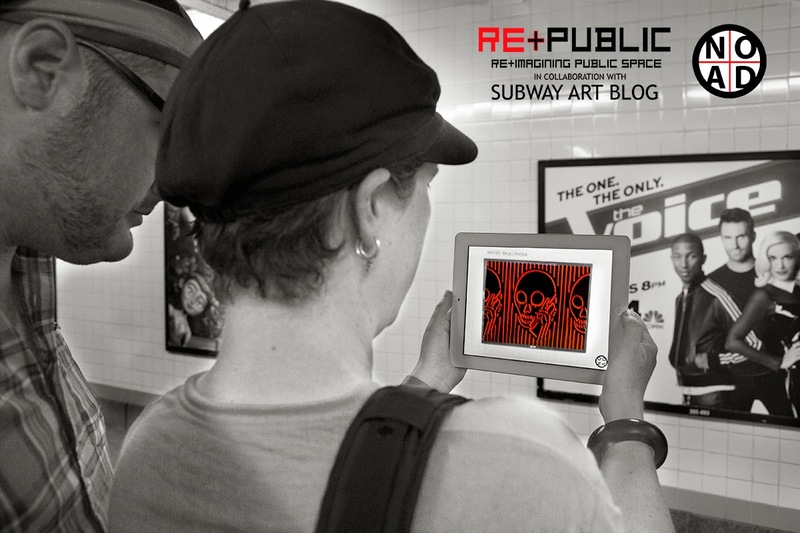 Today, in collaboration with Jowy Romano of The Subway Art Blog, we launch NO AD. This mobile app brings together years of illegal street art antics and my fascination with AR's ability to completely alter our relationship to public space. Below is the gist of the press release we sent out, but I wanted to discuss some of my personal thoughts on the project here as well. If you aren't familiar with NO AD, you might watch this VIDEO before reading this post. NO AD is complicated. It is born out of an interest in getting rid of advertising and replacing that visual content with something better, be it art or whatever else a city might come up with to adorn its own walls. It also shares a history with ad takeover street art work that physically replaces ads with art, initiatives like the artiviser, and Add Art. And yet in practice, NO AD really makes you look at the ads as you try to determine which ones you have already triggered in your pursuit of the new art content strewn across the subway system. It's a little technical issue that should be addressed. In fact all ad takeover work seems to have this same issue lurking in its shadows. When we do work in bus shelters and take on that medium, we attract attention to those same shelters we did not takeover as the public pursues our street work around the city. It's inevitable that we bring unwanted attention to ads in the process. One hopes that despite the increased consumption of advertising caused by our anti advertising activities, a language of dissent is being established that did not exist before. Maybe you ingested a few more ads, but at least you can envision the alternative. So on the one hand, I hope NO AD serves as an example of what could be as a lot of anti advertising work does. In the same way AR is being used to show you what that coffee table will look like in your living room, or how that eyeshadow color will jive with your complexion, NO AD shows us what our transit system might look like if we had a choice. While NO AD currently suffers from your need to actually engage ads to use it, wearables will make this issue moot. If I was wearing a heads up display and running NO AD, it would be a functional ad-blocker for public space. This is something I am very interested in and yet something that makes people very uncomfortable. As artists try to alter public space for the better, we make physical changes that effect everyone. Sometimes that effect is a point of contention, but in general the process is a public dialogue between what works and what doesn't for the larger population. A wearable NO AD app side steps this entire drama and puts everyone in control of thier own public space in an oddly disengaging and separating way. No longer are public space issues publicly negotiated, they are just augmented away. An augmented world is a scary proposition but not one that we can deny is right around the corner. I think NO AD embraces this issue early on and I hope it is a discussion point. What do we allow an augmented public space to look like as a public? What would it mean for us socially if we allowed an app to augment out the homeless? Its a relevant question that the future is going to throw at us so we should probably start thinking about our answers now. Given all of the issues surrounding NO AD's effectiveness as a true ad blocker, and its ushering in a future public space doomed to separate us all, as a way to bring art to New York it works pretty damn well. I hope NO AD is able to fulfill my goal of being updated with very different content every month, curated by individuals, institutions and other wacky organizations. A lot of New Yorkers do not take advantage of the immense arts resources NY has to offer, myself included. We also spend a huge amount of time commuting through our underground rivers. If this app can use the ad infrastructure to bring massive amounts of constantly changing, 2D, 3D, film, music, and other media, I think it fulfills its role as being a useful tool. The other dark waters it stirs are what makes it art. Enjoy! New York City has one of the largest and most robust transit networks in the world with a subway system spanning 468 stations throughout the five boroughs. On average, there are over 4 million daily rides, making the subway system by far the most used form of transit in New York City. Littered throughout almost every station is a repetition of movie, television, product, and alcohol ads, which take advantage of NY’s immense captive transit audience and turn our daily commute into one long commercial for the latest products and commercial messages. For a city that prides itself on being a leading cultural center, and despite the valiant efforts of our MTA arts programming, New York City subways seem to lack a cultural richness befitting this great metropolis. Because the advertising is constantly changing in the subways, so too will the content users see through the app. Each week NO AD will auto update, replacing the new advertisements with original content. In an effort to keep the user experience fresh, we will collaborate with prominent cultural institutions to drastically alter the nature of the content offered, from street art, to photography, to music, poetry, and moving images, you can expect the NO AD app to continually provide new content. We intend NO AD to bring a rich variety of cultural content to users and integrate itself into your daily commute. It is, however, not by chance that we do this using the preexisting advertising infrastructure. Overexposure to commercial has been linked to our behavior and psyche, with studies from the PIRC suggesting “…that advertising may be encouraging society to save less, borrow more, work harder and consume greater quantities of material goods.” This behavior, in turn, puts an unnecessary burden on our environment and ourselves as we forgo personal experiences for material obsession. We see NO AD as a precursor to a viable physical ad blocking software that, used in conjunction with soon to be available heads up display technologies, will drastically alter our relationship to visual imagery in our shared public spaces. Test NO AD by clicking on the links above to install and then testing on the image below.